A wheel that is furnished at equal distances around its circumference with levers, each of which carries a weight at its extremity, and is movable upon a pin, so that in one direction it can lie upon the circumference, while at the opposite side, being carried along by its weight, it may be forced to take the direction of a prolonged radius. 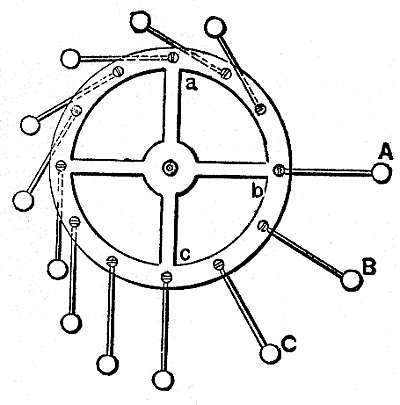 This granted, it will be seen that when the wheel revolves in the direction a, b, c, the weights, A, B, C, will deviate from the center, and, acting with more force, will carry along the wheel on this side. And since, in measure as it revolves, a new lever will turn up, it follows, it was said, that the wheel will continue to revolve in the same direction.